Gallery 25 artists will present a summer show from May 24 entitled “Our Towns”. This show celebrates the beauty of towns in western Connecticut or the uniqueness of the landscape. Continuing until July 29, the show spans several activities that may be of interest to New Milford residents, visitors, and artists. 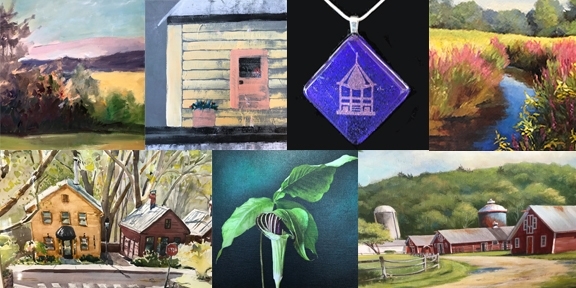 More than 20 gallery artists are exhibiting works in a variety of media, including oils, water media, graphics, jewelry, pottery, fused glass, wood turning and carving, and hand-pulled prints. On June 9, the gallery will participate in Connecticut Open House Day celebrating the exceptional cultural assets across the state and, from 4 to 7 pm, will host an opening reception for its show “Our Towns”. Sponsored by the New Milford Commission on the Arts, Gallery 25 was founded as a cooperative-style all fine art gallery representing local and regional award-winning artists and artisans. Renewing interest and growth in the local art scene is a priority of the art commission, Gallery 25, and its member artists. Gallery 25 is conveniently located at 11 Railroad Street at the historic train station in New Milford, Connecticut (http://newmilfordgallery25.blogspot.com). Gallery hours are: Thursday & Sunday 12 pm - 5:00 pm, Friday & Saturday 12 pm - 8:00 pm, or by appointment (phone 860-355-6009). Viewing the exhibition is free. Ample free parking is available.